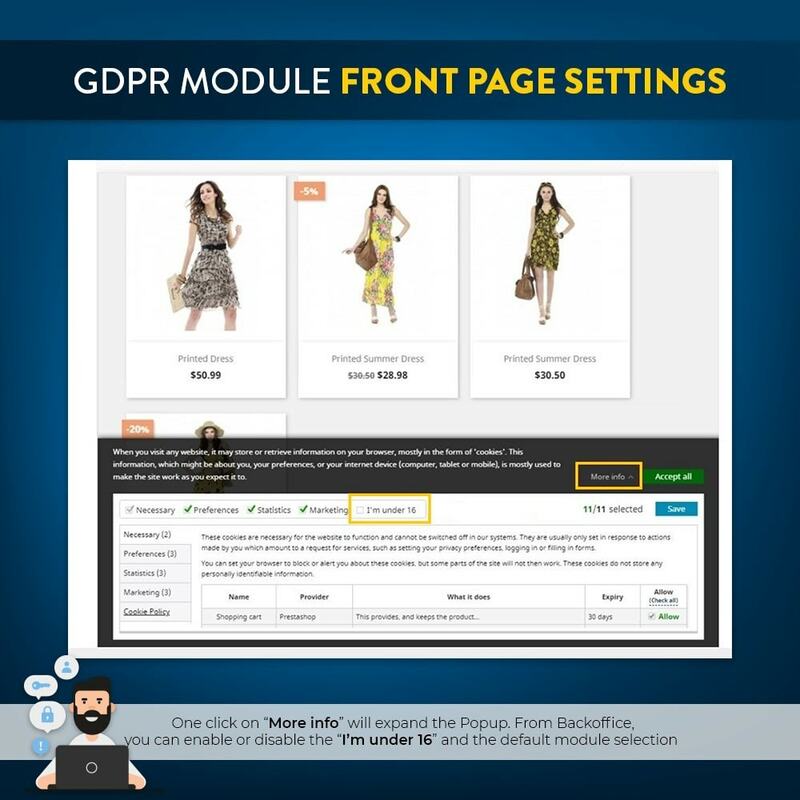 This is the single module out there which is covering exactly what GDPR means. 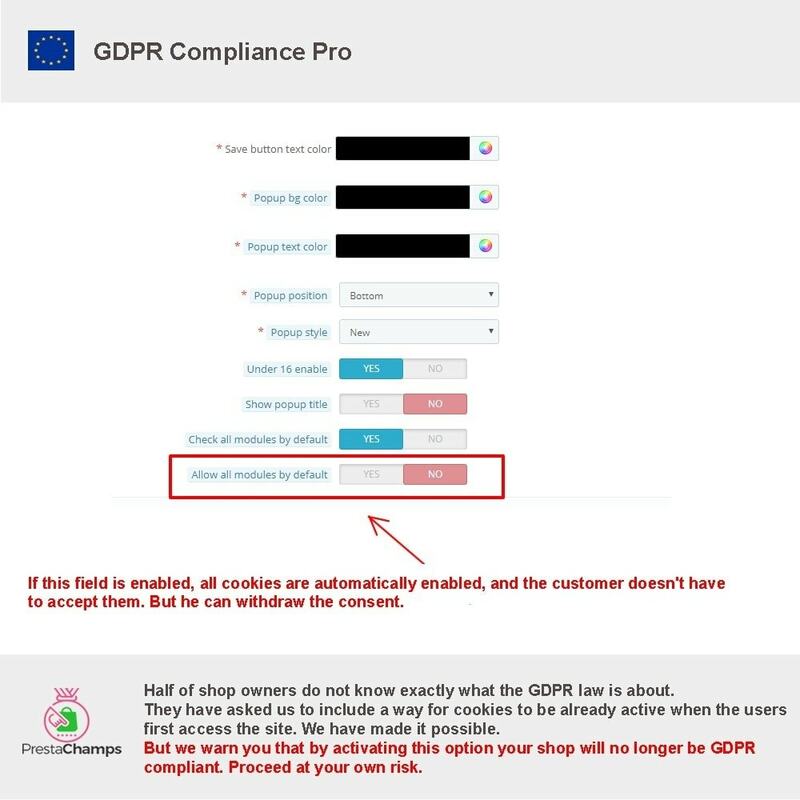 AS a Shop owner you need to find a way to give the Visitor an option to Opt-out from any Cookies which the site uses. WE made sure that by a simple selection from the module list you can offer the options to the client. 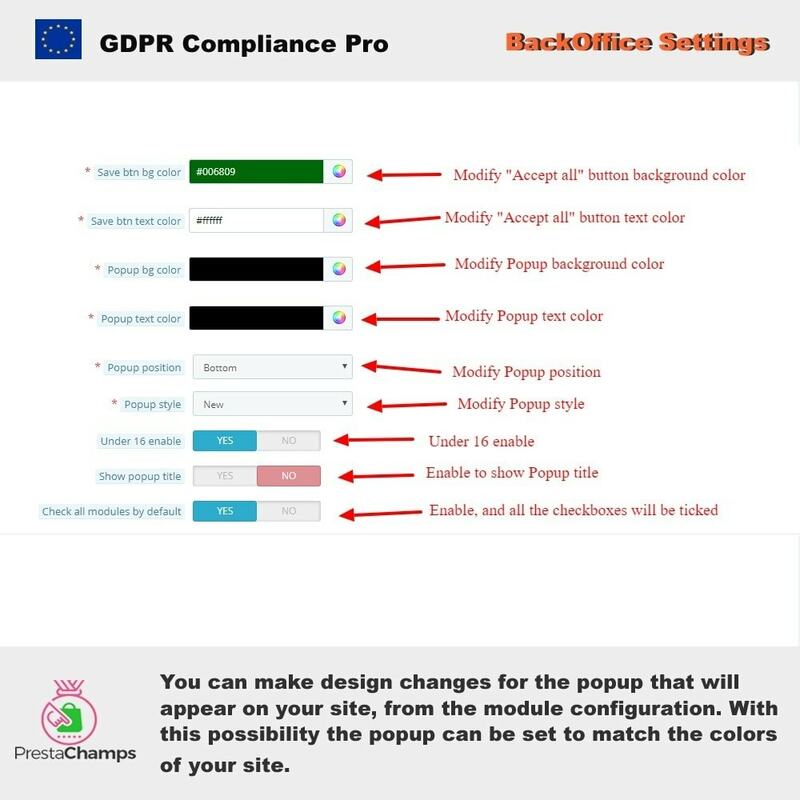 The module allows the client to opt-out from : Facebook Pixel, Google Tag Manager, Google Ad words Tracking, Standard Prestashop Tracking! 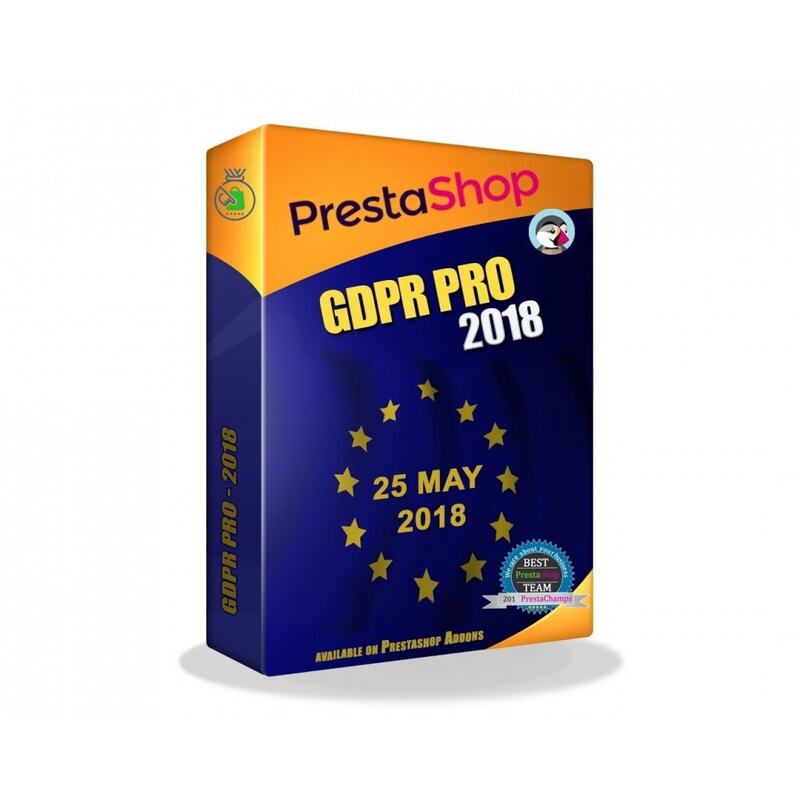 Assures compliance with the GDPR legislation allowing the store to operate legally, avoiding fines of up to 20 million euros or 4% of the global annual turnover. The pop-up presented to first-time visitors is fast, responsive and we made it as unintrusive as possible to make sure that possible clients are not turned away by it. 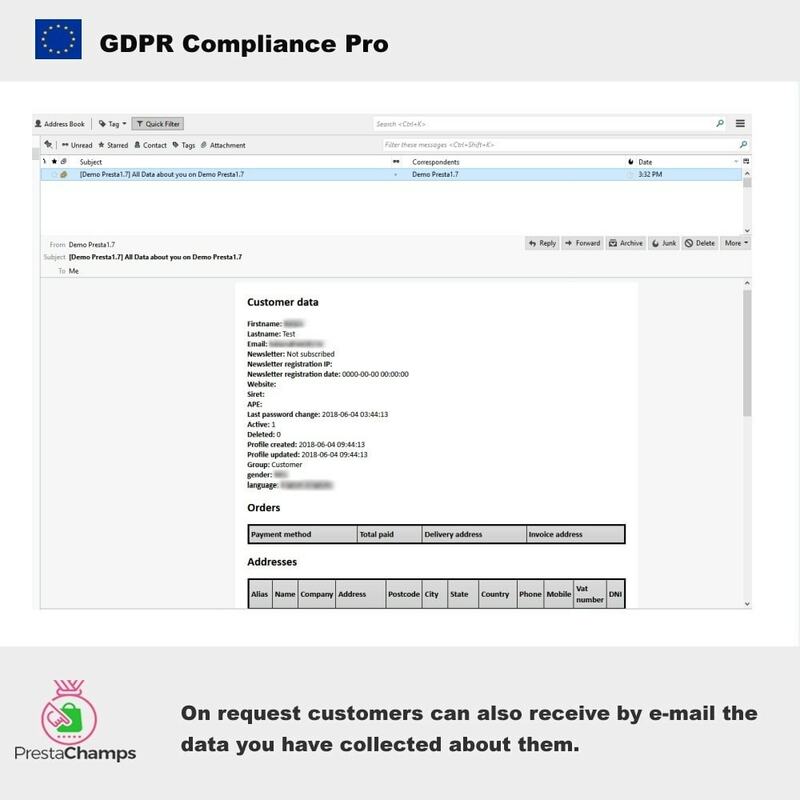 Shop owners or data protection officers can be quickly notified if anyone requests the erasure of their data and act on this request in the shortest time possible. 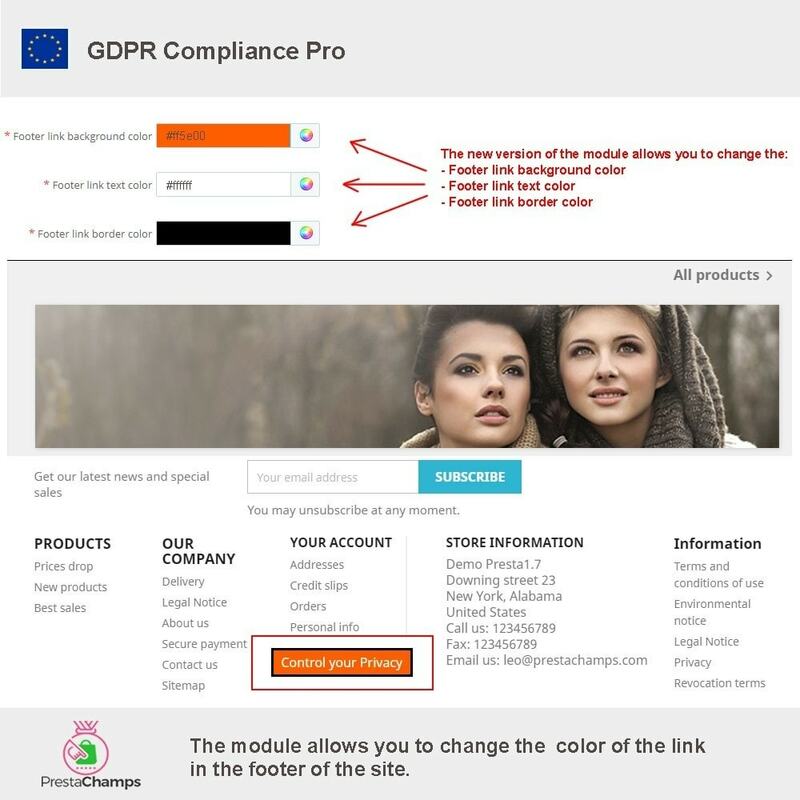 The GDPR module allows adding detailed description about what personal data is needed and for what purposes it is used, ensuring that customers can make an informed decision when opting to activate other modules on the site. 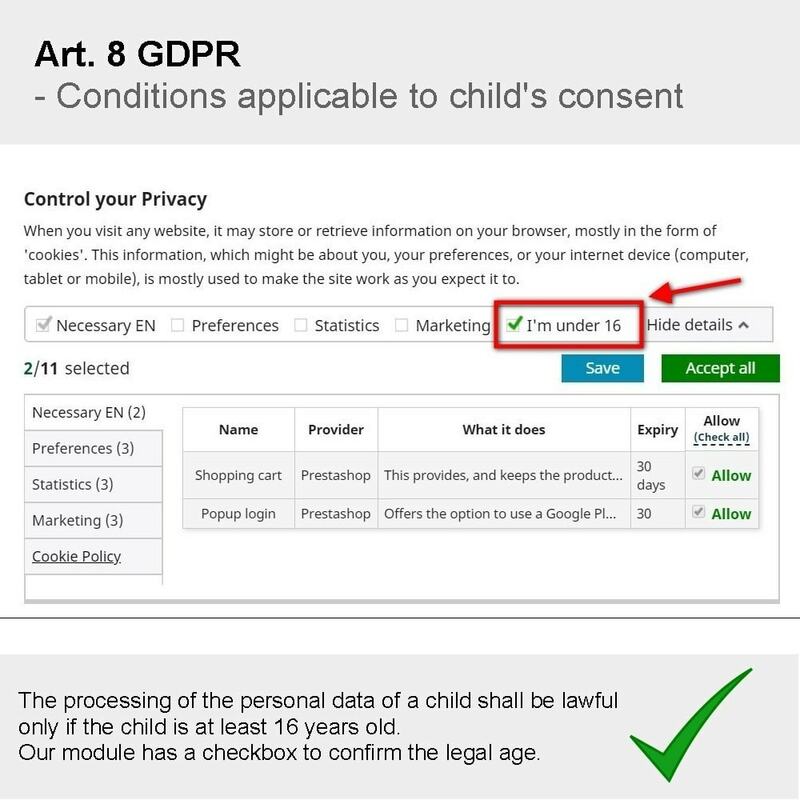 The processing of the personal data of a child shall be lawful only if the child is at least 16 years old. Our module has a checkbox to confirm the legal age. 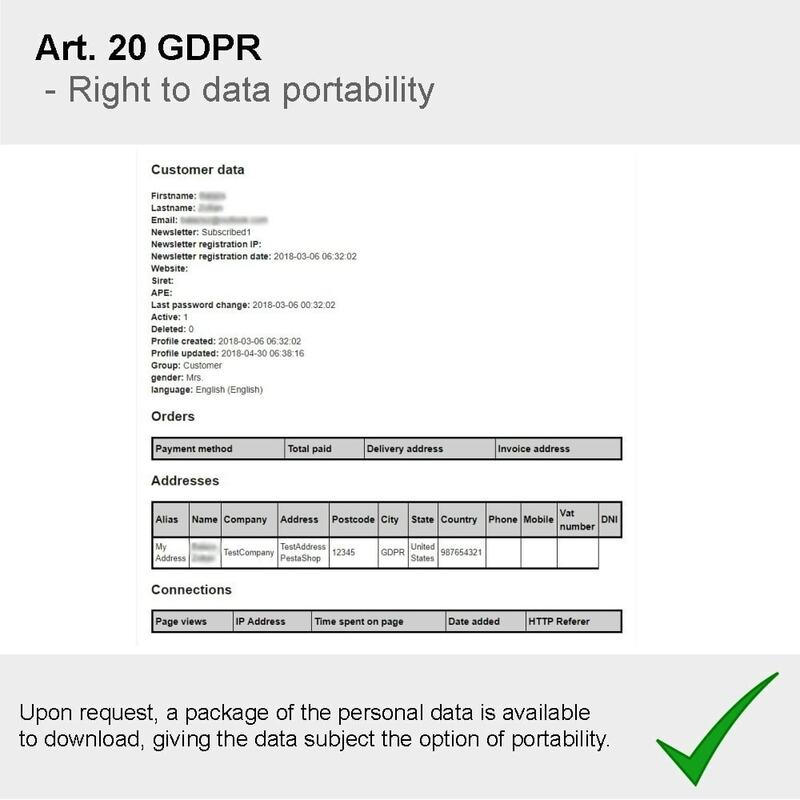 The data subject has access to the personal data by request. They are able to view / download this from their account. 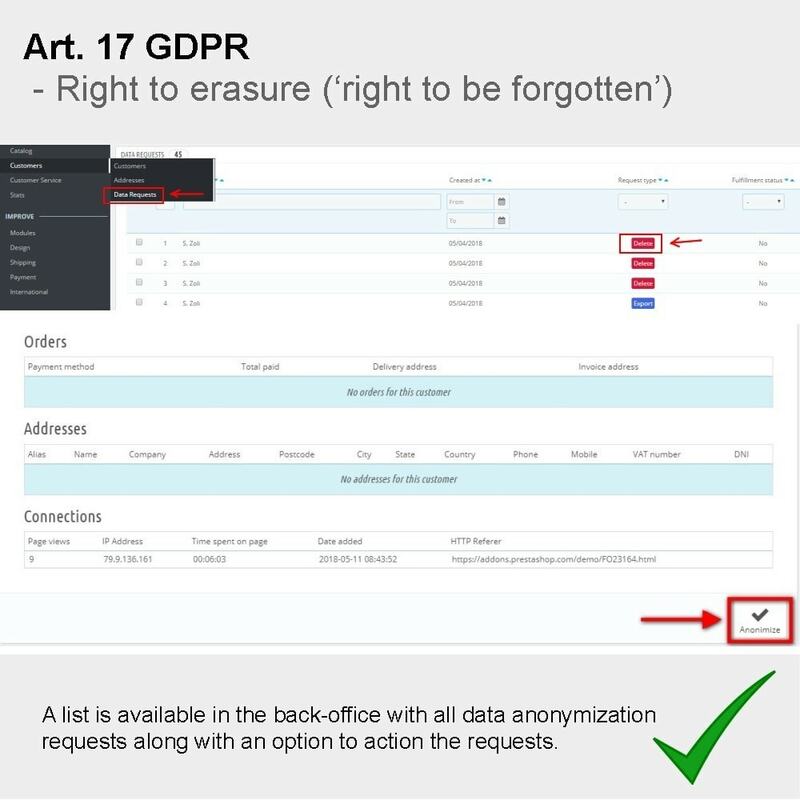 The data subject can request the erasure or anonymization of their personal data. This can be actioned by the store admin in the PrestaShop back-office. 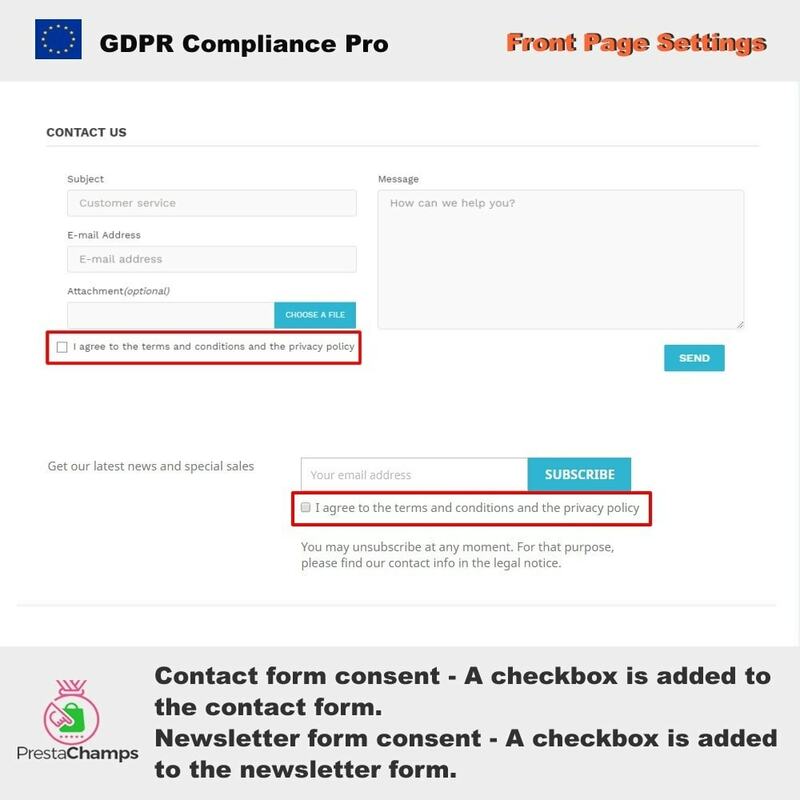 The request for consent is presented in a manner which is clearly distinguishable from the other matters, in an intelligible and easily accessible form. 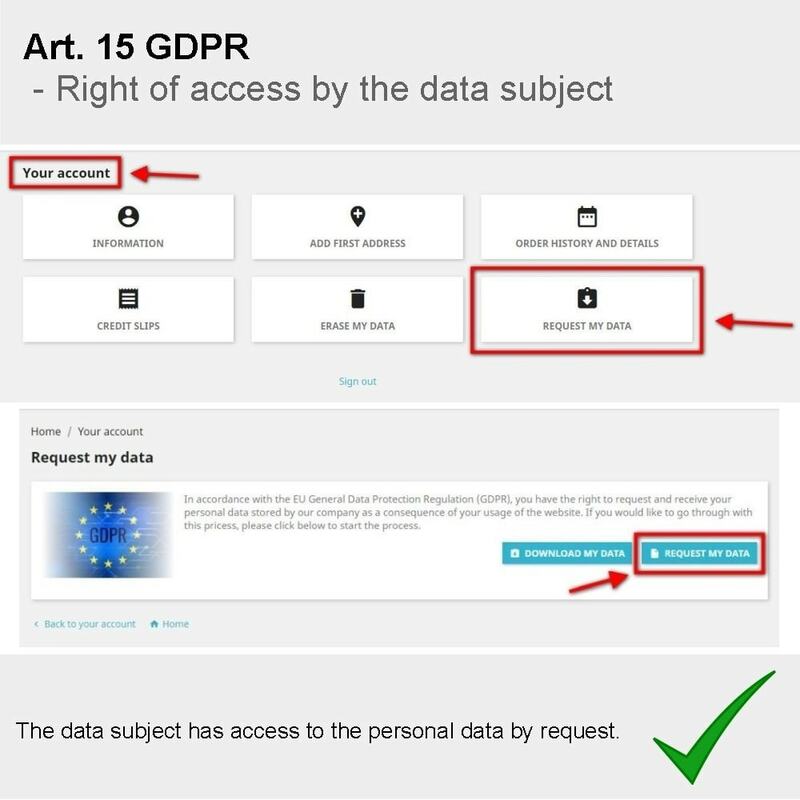 The data subject has the right to withdraw his or her consent at any time using the "Control my Privacy" option. 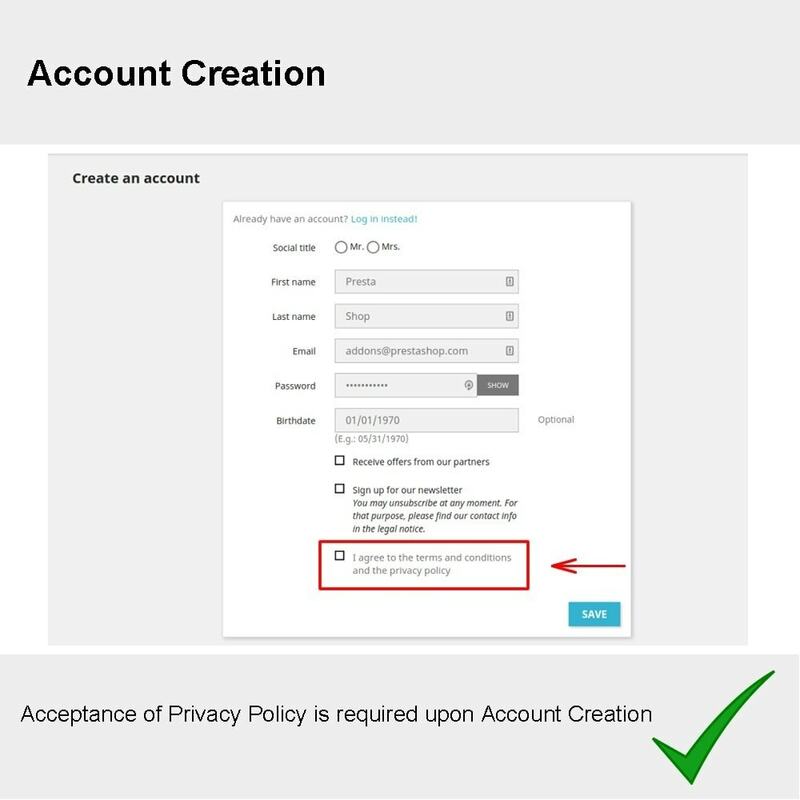 Choose which modules you want to allow users to opt into or out of using. 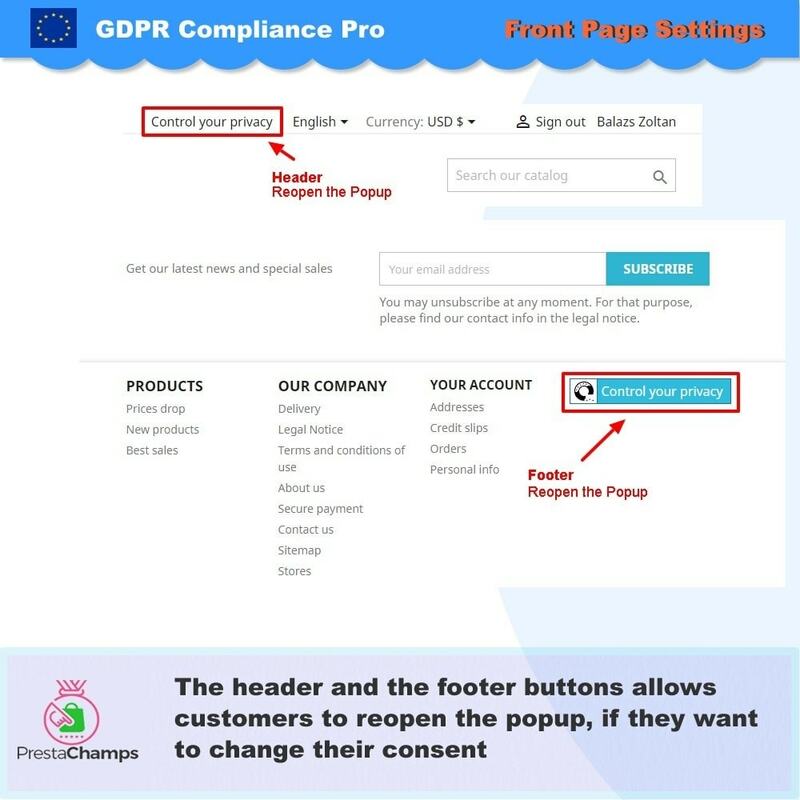 You can customize all the content in the pop-up, including the main "Welcome" text as well as the information regarding strictly necessary cookies which are required for the shop to function properly. 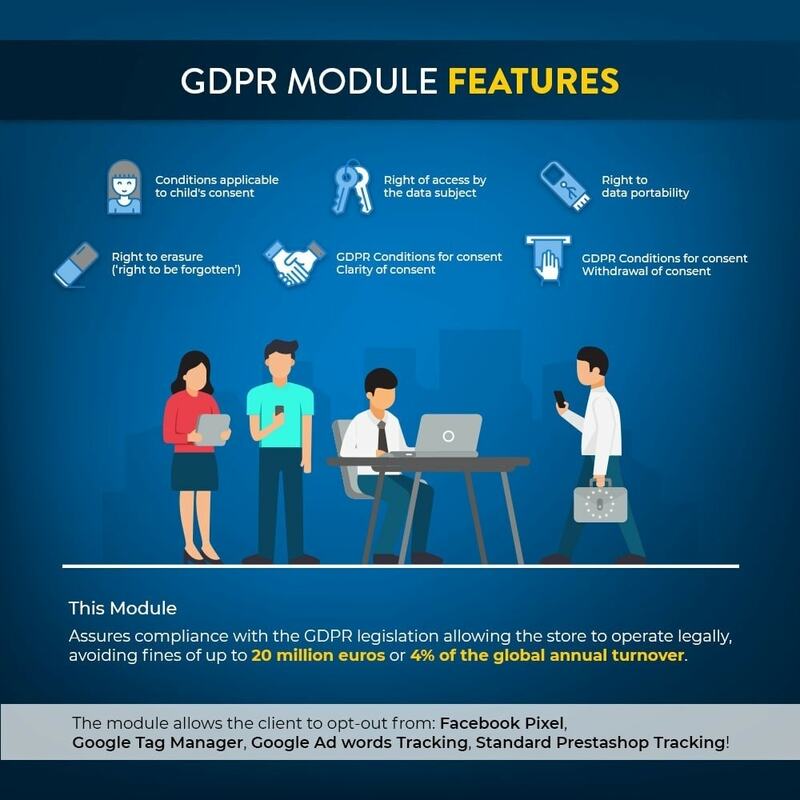 You can add detailed description regarding every module customers can opt into using, ensuring that they will make an informed decision and that they understand how opting out can affect their experience going forward. 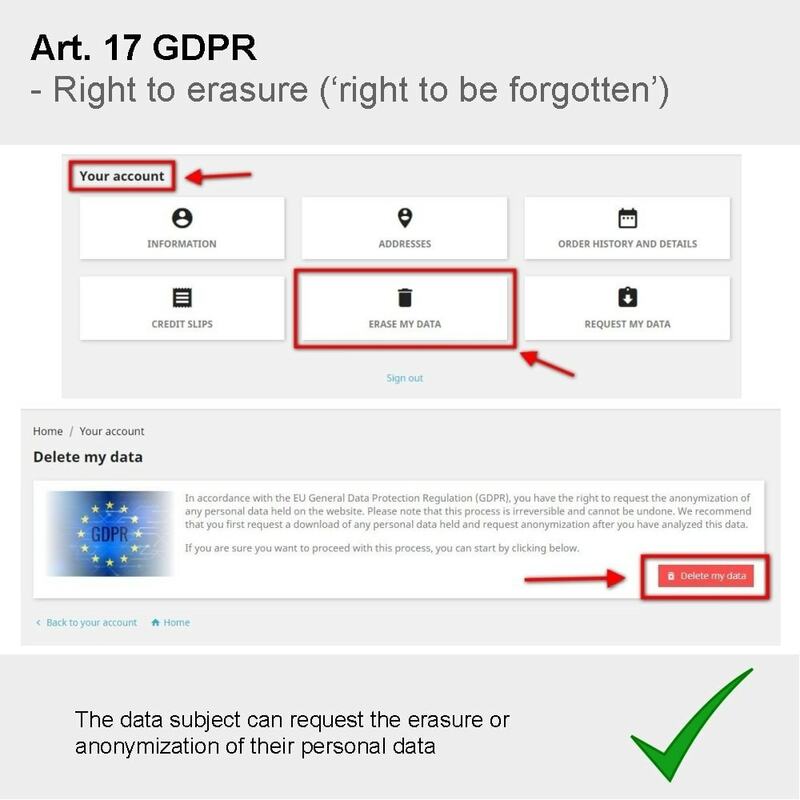 Customers have the option to request the removal of their personal data. If this occurs, an email will be sent to the shop owner or Data Protection Officer. The module adds a link in the footer which allows customers to revisit their choices. Basic coding experience is sufficient to place this link in any other area of the front-office. 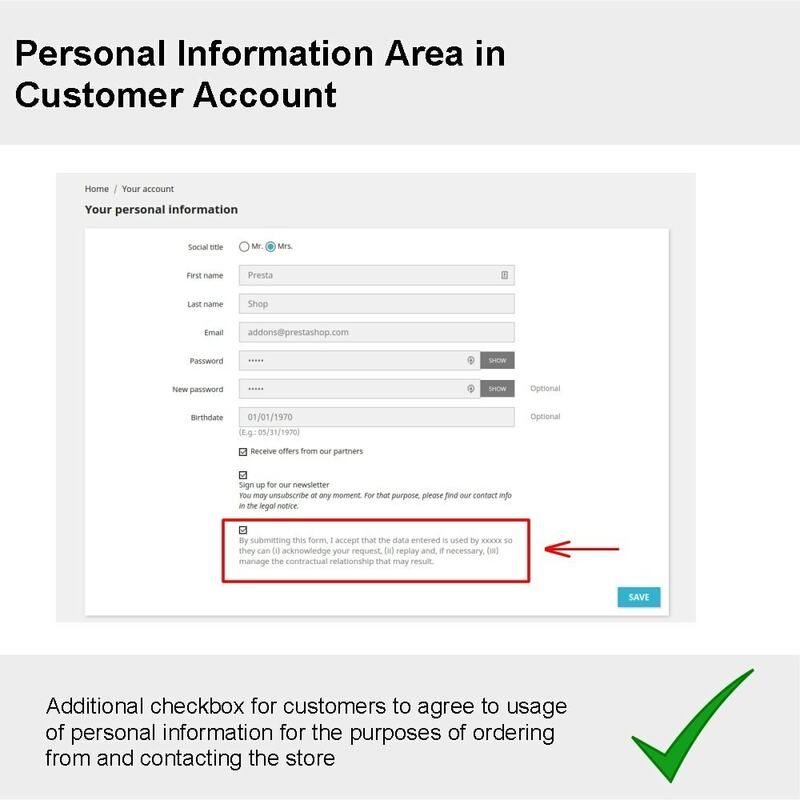 Customers will be informed of what personal data is required of them and how it will be used. Customers can choose which modules they want to keep active during their visit on the site. A special link in the footer allows them to re-open the pop-up and customize their preferences at any time during their visit. Customers can request to have their personal data erased from the store at any time.